Financial data providers are a key part of the the financial professional's workflow. For the investment banking analyst who needs to find historical data and forecasts in order to build a 3-statement model or for the currency trader looking for real-time quotes, up-to-date and accurate financial data is critical. As it currently stands, the financial data industry is dominated by 4 large providers: Bloomberg, S&P (Capital IQ + SNL), FactSet and Thomson Reuters Eikon. All four try to offer a one-stop-shop platform that provides all types of financial data services (with a massive price tag, as you’ll see below). The goal of this article is to provide a thorough comparison of cost, industry relevance (buy-side vs. sell-side) and killer apps and features that might push users to favor one data provider over another. Bloomberg is the 800-pound gorilla in the financial data world, with financial data revenue of approximately $9 billion and 325,000 terminals currently licensed. It controls more than 33% of the financial data market. Its closest rival is Thomson Reuters, with 23% of the market share. The cost of a Bloomberg Terminal is $24,000 per year, and terminals are leased on a two-year basis. The price drops to $20,000 per terminal per year for 2 or more terminals. Academic discounts: For universities looking to power their finance labs with the famous terminals, Bloomberg offers significant incentives. For example, once schools commit to 3 terminals, they can get nine additional machines for free, dropping the total per-terminal cost to as little as $3,000 per year. Buy side, sales and trading and asset management. 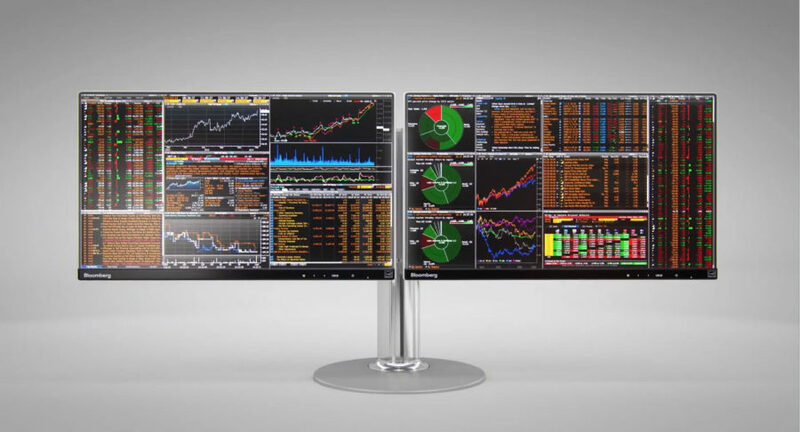 While the Bloomberg terminal is used across the financial services world, it is used predominantly by portfolio managers, buy-side analysts, and sell-side finance professionals within the sales and trading and asset management functions. You’re in any way involved in the bond market. Bloomberg’s fixed income data is second to none. Its data sets are more comprehensive and are updated more quickly than any of its peers, making it especially useful for credit research analysts, fixed income sales and bond traders, and professionals in debt capital markets. Then there's Bloomberg’s instant messaging service — one of Bloomberg’s arguably stickiest features. Bloomberg’s IM service allows anyone on the terminal to IM with others on the terminal. Why is this exciting? Because if traders at all the trading desks are posting quotes on Bloomberg IM and nowhere else, you simply have to be on Bloomberg. It’s basically the same reason you’re on Facebook and not on MySpace. This is a sticky feature for Bloomberg as it faces competition from Thomson Reuters' Eikon platform and chat-only startup alternative Symphony. In an effort to kill Symphony, in October of 2017 Bloomberg surprised many observers by decoupling IM from the rest of the terminal license. It now charges $10 per month for IM-only (your company does have to own at least one terminal to be able to get this service for additional users). You’re in investment banking. Investment bankers do not use Bloomberg as widely as some of their sell side peers and buy side professionals. For example, the M&A team at an investment bank might have a couple Bloomberg Terminals available, but it's unlikely that each banker will have their own machine. Instead, investment bankers are far more likely to have their own dedicated FactSet or Capital IQ subscription. 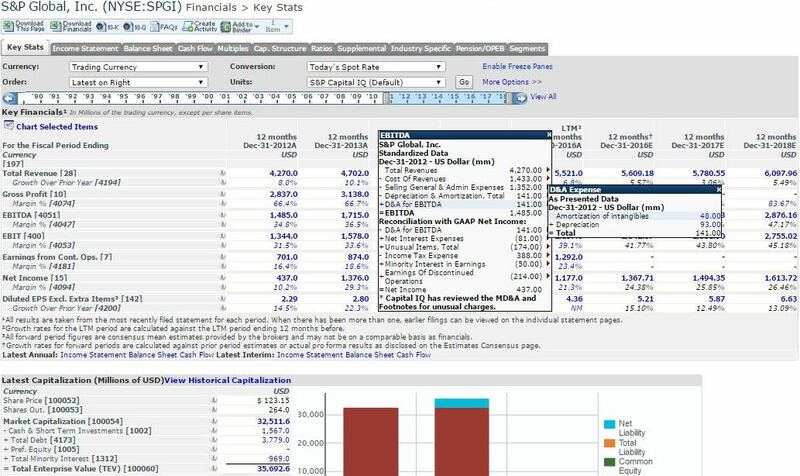 That’s because Capital IQ and FactSet have developed specific capabilities such as a click-through to audit data in source documents, Excel plugins that increase productivity, and company and transaction screening tools designed specifically with the investment banking workflow in mind (more on this below). Capital IQ is the relative new kid on the block. It was founded in 1998 and was acquired by McGraw Hill’s S&P division for $200 million in 2004. 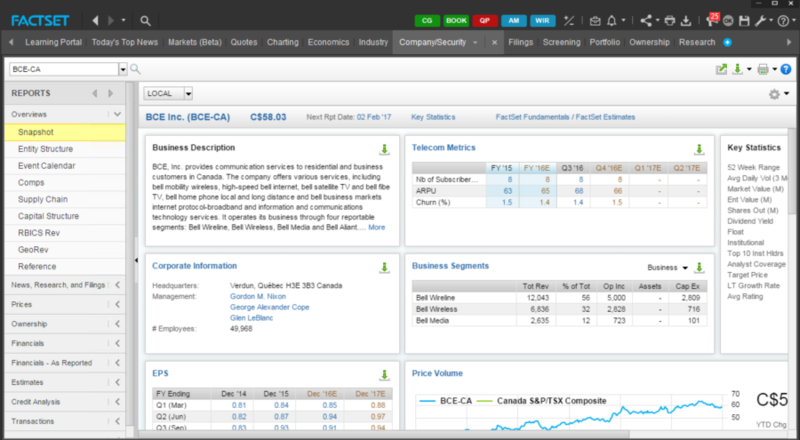 Unlike Bloomberg or FactSet, Capital IQ is a web-based portal accessible from any machine. The Capital IQ offering was strengthened further in July 2015 with McGraw Hill’s $2.2 billion purchase of rival SNL. While Capital IQ and its largest rival FactSet provide financial data across all sectors, SNL’s strength has been unparalleled financial and transaction data sets within specific sectors, namely insurance, banking, real estate, energy, metals and mining, and media. One of our favorite things about SNL is that they send you $50 if you catch a mistake in their database. Fellow finance nerds will be happy to know that S&P intends to continue providing this perk (and it now appears to apply to Capital IQ mistakes as well). While S&P does not disclose Capital IQ and SNL revenue separately from its other data products within the “Markets and Commodities Intelligence” segment, it's likely that Capital IQ and SNL represent the vast majority of the segment’s $2.2 billion in subscription revenue. Capital IQ pricing starts at $13,000 per user per year with a minimum of 3 users and drops to as low as $7,500 per user per year for larger numbers of users. However, pricing can go up significantly with additional features. For example, the ability to download equity research reports comes at an extra cost — either on a per-download basis or unlimited at $2,500 per year. In addition, SNL has now been integrated into Capital IQ S&P and is currently sold as a separate product with an additional cost. Investment banking. Bankers do a lot of data scrubbing, spreading comps and company profiles, and Capital IQ is designed specifically to help with this. Scrubbing data: When a company reports its third quarter earnings, the GAAP-based numbers like operating profit, net income and earnings per share are often not the numbers anyone actually cares about. Instead, analysts pore through the footnotes and disclosures to arrive at “normalized” “non-GAAP” data like EBITDA and cash EPS. Finding and scrubbing this data is time consuming work, and mistakes can significantly impact the output of an investment banker’s analysis. Capital IQ’s fleet of data scrubbers try to do it for you. Coupled with its killer app that allows analysts to click back to audit the source data, this feature largely explains Capital IQs enduring popularity in the investment banking world. Click-through to audit source data: One of its early killer apps was a feature that allows analysts to click-through to audit source data. For example, when a user wants to verify that Capital IQ correctly arrived at Walmart’s EBITDA, he/she can simply click through from the portal to the source documents. Excel plugin: Capital IQ’s Excel plugin enables analysts to pull data directly into Excel. While not as robust as FactSet’s Excel plugin, which has robust productivity enhancing tools like custom Excel formatting macros and PowerPoint presentation macros, Capital IQ has made strides in bridging the divide with some custom Excel shortcuts and formatting macros. You’re on the go and need to access financial data from a variety of computers. While Bloomberg access requires a dedicated terminal and FactSet access requires a software installation on each machine, your Capital IQ account can be accessed from a web browser anywhere. Real-time market data isn’t critical for your job. This is where Bloomberg (the king), along with FactSet and Thomson Reuters, are better than Capital IQ. The kinds of roles where this really matters are on the buy side, in sales and trading, and in public equities and fixed income. As of 2017, FactSet had 89,000 clients with total revenue of approximately $1.3 billion, making it the fourth largest player in the financial data space after Bloomberg, Thomson, and S&P (Capital IQ + SNL). Per FactSet’s 2017 10K, buy side clients accounted for 84.1% of revenue, while the remainder came from the sell side (i.e. M&A, capital markets and equity research). The cost of a FactSet subscription is $12,000 per year for the full product. Investment bankers. FactSet is comparable to Capital IQ in terms of scope of data and functionality. Much of Capital IQ’s early strength has been bridged by FactSet, which now boasts its own set of comprehensively scrubbed financial data, estimates and click-through functionality. Your life revolves around making pitchbooks. While Capital IQ’s Excel CIQ codes are somewhat easier to work with, FactSet’s 2007 purchase of DealMaven gives FactSet users the ability to increase financial modeling efficiency via helpful formatting and custom macro shortcuts that Capital IQ hasn’t quite caught up to yet. In addition, FactSet’s PowerPoint plugin enables bankers to automate much of the pitchbook presentation process. Another frequently cited FactSet advantage over Capital IQ is the ease of navigation and getting around the user interface. You need equity research. FactSet does not offer robust equity research access. You could, of course, access this through another service, but if you want it all in one place, FactSet isn’t the right choice. Perhaps even more of a deterrent for some is that FactSet requires a physical installation on each machine, and it is only allowed on two machines per subscription. 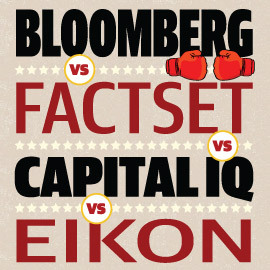 While Capital IQ differentiates itself on cost, its focus on fundamental data, and usefulness on the sell side, Eikon is the most direct competitor to the Bloomberg Terminal. 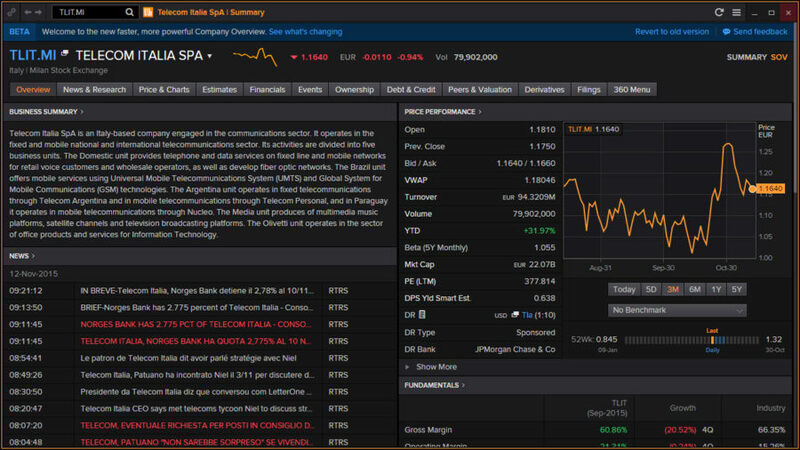 The cost of Thomson Reuters’ Eikon is $22,000 per year, but a very stripped down version can cost as little as $3,600 per year. Those who would otherwise buy Bloomberg but want something cheaper. It has a lot of the same financial data as Bloomberg but is generally considered to be the lesser option in terms of data breadth. To put it bluntly, it’s what you get junior staff if you want to save costs while the senior folks are using Bloomberg. In addition, Eikon is popular in Europe and the Middle East, with the EMEA region accounting for 41% of its revenue. Americas was 40% and Asia Pacific was 19% (Source: Thomson Reuters 2017 Factbook). PitchBook: Unlike the other financial data providers, PitchBook is focused on private transactions. Mergermarket: A database of M&A transactions. While Capital IQ and FactSet maintain large M&A databases and have tools for screening M&A and other transactions, Mergermarket is dedicated to hunting down details for M&A deals. Because it specializes in M&A, it's not a substitute for FactSet's or Capital IQ's broad data sets and features. Rather, it's a supplement when finding historical transaction data is critical to the job. The rest: A growing number of small startups are trying to disrupt the industry with their own specific features and and a lower pricetag. For example, Symphony is attempting to peel users away from Bloomberg’s popular instant message service; Estimize wants to give estimates to the masses through crowdsourcing; Briefing.com and money.net are going after news, charting and real time data. While their day might come, they have not yet meaningfully threatened the Big Four. When serious finance professionals need financial data, most are still coughing up serious $$$ for one of the big providers. Interesting overview, just a quick note on FactSet, FactSet does nowadays offer access to its applications through a (not locally installed) weblink and a mobile app. Makes for easier access for some users indeed. Thanks for letting us know Lindi! How does Marketmap by FIS Global compare against the other data terminals? We are not sure as no one at WSP has worked with that platform. Also, Metisglobal has not been compared. And I wonder why it is quite popular in Pakistan - definitely after bloomberg. Appreciate you sharing your knowledge - thanks! Please compare them from the perspective of sell-side equity research professionals. Thanks for your suggestions! I would say broadly, each system has its relative strong/weak points. Is there any specific question you have in mind? Thanks! I am a researcher who is currently working on a project related to sell-side equity research. I really think it would be good for me to write a comparative note on these information services. Also, I am based in Pakistan, so some of those might not be relevant. Good comparison in terms of pricing info & product offerings. I worked with S&P Capital IQ.